The Monarch Butterfly needs our help. Collectively, even the smallest patch of native milkweed growing in our backyards—can help to restore and replace habitat lost from decades of pesticides and development. Even One Native Milkweed Plant Makes a Difference. A simple stand of native milkweed can make every backyard, school, community center, city park and place of worship a haven for breeding or migrating monarchs, and together we can bring about the greatest citizen conservation victory of our generation. Why Just Milkweed? And Why Native? Milkweed is the only plant the Monarch Butterflies use to breed and is the main source of food for their developing larvae. There are many kinds of milkweed, but choosing which to grow is simple: local and regional natives only. Native is the key word, but please don’t disturb milkweed in the wild to add to your yard. Grow your own milkweed from seed or buy plugs from nurseries specializing in native plants. Availability of native milkweed from nurseries fluctuates and some nurseries may sell non-native varieties alongside natives. Avoid non-natives, like Tropical Milkweed, as their extended growing seasons can disrupt the Monarch migration cycle! 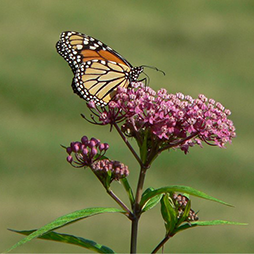 To learn more about milkweed and the national collaboration underway to save the Monarch Butterfly, see the US Fish & Wildlife ‘Save the Monarch Butterfly‘ resource page. The Maryland Native Plant Society lists area nurseries who stock native varieties assured to have a local or regional heritage. The society recommends calling the vendors to check availability. Of the dozen or so types of milkweed native to Maryland, your best choices include: Butterfly Weed Asclepias tuberosa, Swamp Milkweed Asclepias incarnata and Common Milkweed Asclepias syriaca. If you decide to start your milkweed from seeds (super easy to grow! ), start with quality, all-native, non-GMO seeds. You can start the seeds indoors earlier, or sow them directly in the ground. On our page ‘Flowers to Attract Bees, Birds and Butterflies‘, you’ll find specific information and planting guides for each seed type or seed blend we recommend. Please spread the news and encourage everyone you know to join in the national effort to Save the Monarch Butterfly!